In the 1880s, a group of Jewish settlers from Poland settled in Ein Zeitim, a few kilometers from the Kerem Ben Zimra/Dalton area of today. They planted vineyards in an attempt to revive agriculture in the area, but droughts and other difficulties doomed the venture, and the conventional wisdom was that the area couldn't sustain vineyards. A hundred years later, the Haruni family arrived from London. Their experience and expertise in the wine industry gave them the confidence to plant vineyards in the area again, and when the first crops proved successful, they established the Dalton Winery. Today, the winery is a favorite stop for visitors to the area who are curious about fine wine-making and the development of the industry in Israel. Visitors learn that the plateau where the grapes are planted is 800 - 900 feet above sea level. This high altitude, combined with optimum soil conditions and a cool climate (including a cold winter to give the vines a dormant period) provide the ideal conditions for growing grapes which are suitable for fine wine-making. Sauvignon Blanc - these grapes are grown entirely in shade, and no direct sunlight hits the grapes, creating a fine white wine. Chardonnay - the grapes ferment and age in oak, giving the wine a fruit and vanilla character. Shiraz - a vigorous wine whose concentrated flavor is established by limiting the fruit yield. Cabernet Sauvignon - a rich wine whose taste improves with time. One of Dalton's winemakers, Na'ama Mualem, is a woman, a rarity in the wine-making world. Dalton exports to Italy, Spain, Switzerland, the United Kingdom, France, America and Canada. 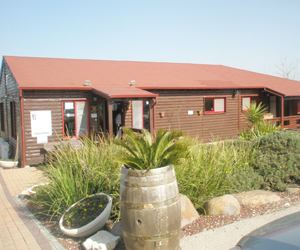 The winery has a visitor's center, which offers tours of the winery and a factory outlet shop offering wines and other products of the Galilee. It is a stop that many visitors to the Galilee have been pleased that they made, not only to purchase these world-renowned wines in their winery, but for the opportunity to learn about the wine-making process. Dalton wines are recognized throughout the world for their excellence and have won honors and awards in competitions.